Capturing high quality customer data on mobile devices is essential to making products that customers love. But the process to capture that data can be tedious. 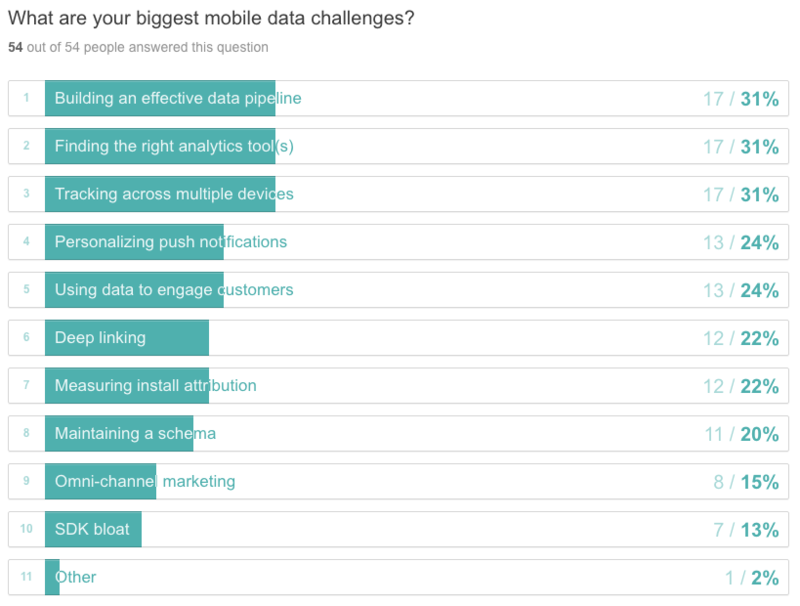 We polled attendees at our recent WWDC meetup—a mix of engineers, data analysts, and growth marketers—on their biggest mobile data challenges. Building an effective data pipeline. Finding the right analytics tool(s). Last week, Hakka Labs and Segment teamed up to host an event about the right way to track mobile data. We recruited panelists from Instacart, Pandora, Branch Metrics, Invoice2go, and Gametime to discuss mobile customer data collection and share their experience in overcoming data obstacles. A video of the entire panel will be available soon. In the meantime, we wanted to share some of the insights we learned about the biggest mobile data challenges affecting teams today. Develop a naming schema that’s followed across your company — and teach your company to follow it. Implement a central repository for all of your data. Instacart embeds analysts on product and marketing teams to set the tracking schema and KPIs from the beginning of projects. It’s on the analysts to standardize the data and make it easy to use. Instacart has found that leaving this to the analysts ensures that the data provides what the team is looking for in the end. But the schema is only part of it. To give you a more complete perspective on how business is performing, you should bring your customer data from various systems into a central repository. “You can’t optimize for just one metric, or it will all fall apart,” said Che Horder, Director of Analytics at Instacart. Once you’re collecting data, figuring out how to make it actionable is a wholly separate challenge. A number of the panelists recommended Amplitude and Periscope for analysis, but your own data needs might differ. Horder and Jubera both talked about how Segment makes it easier to try new tools. It even allows you to keep your historical data, so that you can use a new tool as if you’ve had it on since day one. 26% of ecommerce purchases start on a mobile device (but finish elsewhere), which makes cross-device tracking crucial. Mada Seghete, co-founder of Branch Metrics, built her entire business on the idea that without an effective method of tracking user activity across devices, you’re missing a big part of story. “We track across mobile and web by tying user-level tracking with device IDs,” said Jubera. Horder said they make sure they use the same naming taxonomy across devices to analyze the same features and understand how user behavior differs between devices. For example, by tracking performance across different platforms, Instacart discovered that their shopper app performed slowly on a few types of Android devices, and now they’re working on enhancements to make every version faster. As a Segment Warehouses customer, they’re able to combine online and offline data from their mobile app, website, and other back office systems to connect the dots across the entire customer experience. Front load the planning. Start with a tracking plan. Have a clear thesis. Nothing ships without hypothesis, goal and metrics. As you progress, hold teams accountable to the data. Always talk to your customers, even after product market fit.